God of War’s combat is exciting but it’s the little things that really leave an impression. A snow-covered walkway is making people freak out thanks to some crunchy sounds and dusty footprints. Kratos wants to do one thing in God of War: get to the top of the land’s highest mountain and scatter the ashes of his recently deceased wife. After a journey that takes him and his son Atreus through distant realms and monster-filled mines, they reach the summit of the mountain. Thick snow coats the ground and it’s gorgeous. Each step leaves a mark and trudging through the snow creates realistic looking deformations and prints. Bashing enemies or throwing your axe into it kicks up fluffy puffs. I mean, look at that. 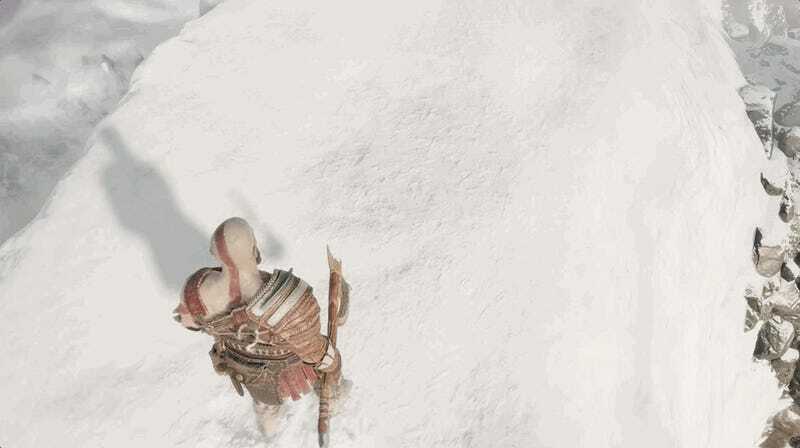 I could chuck my axe into the snow all day but then Kratos and his son will never complete their presumably emotional journey. I can practically hear Kratos’ voice in my ear: “Boy! There is no time for frivolity! Be wary of catching snuffles!” I’m not the only one in love with the snow. Social media users are spending a lot of time marveling at it too. Seriously, it’s really great snow.